The diesel internal combustion engine differs from the gasoline powered Otto cycle by using a higher compression of the fuel to ignite the fuel rather than using a spark plug (“compression ignition” rather than “spark ignition”). The Diesel cycle is a combustion process of a reciprocating internal combustion engine. In it, fuel is ignited by heat generated during the compression of air in the combustion chamber, into which fuel is then injected. This is in contrast to igniting the fuel-air mixture with a spark plug as in the Otto cycle (four-stroke/petrol) engine. Diesel engines are used in aircraft, automobiles, power generation, diesel-electric locomotives, and both surface ships and submarines. In the diesel engine, air is compressed adiabatically with a compression ratio typically between 15 and 20. This compression raises the temperature to the ignition temperature of the fuel mixture which is formed by injecting fuel once the air is compressed. The ideal air-standard cycle is modeled as a reversible adiabatic compression followed by a constant pressure combustion process, then an adiabatic expansion as a power stroke and an isovolumetric exhaust. A new air charge is taken in at the end of the exhaust, as indicated by the processes a-e-a on the diagram. 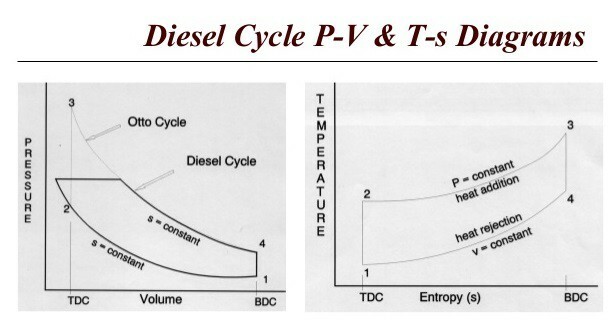 The Diesel cycle is assumed to have constant pressure during the initial part of the combustion phase. This is an idealized mathematical model: real physical diesels do have an increase in pressure during this period, but it is less pronounced than in the Otto cycle. In contrast, the idealized Otto cycle of a gasoline engine approximates a constant volume process during that phase. In this process, the piston moves from Bottom Dead Centre (BDC) to Top Dead Centre (TDC) position. Air is compressed isentropically inside the cylinder. Pressure of air increases from p1 to p2, temperature increases from T1 to T2, and volume decreases from V1 to V2. Entropy remains constant (i.e., s1 = s2). Work is done on the system in this process (denoted by Win in the diagrams above). In this process, heat is added at constant pressure from an external heat source. Volume increases from V2 to V3, temperature increases from T2 to T3 and entropy increases from s2 to s3. Here the compressed and heated air is expanded isentropically inside the cylinder. The piston is forced from TDC to BDC in the cylinder. Pressure of air decreases from p3 to p4, temperature decreases from T3 to T4, and volume increases from V3 to V4. Entropy remains constant (i.e., s3 = s4). Work is done by the system in this process (denoted by Wout in the p-V and T-s diagrams above). In this process, heat is rejected at constant volume (V4 = V1). Pressure decreases from P4 to P1, temperature decreases from T4 to T1 and entropy decreases from s4 to s1. This cycle can operate with a higher compression ratio than the Otto cycle because only air is compressed and there is no risk of auto-ignition of the fuel. Although for a given compression ratio the Otto cycle has higher efficiency, because the Diesel engine can be operated to higher compression ratio, the engine can actually have higher efficiency than an Otto cycle when both are operated at compression ratios that might be achieved in practice.